ABVLM provides an online application to sit the upcoming board exam each year. Applicants are able to complete the application, upload their documents, and pay the fee online. Physicians certified in Venous and Lymphatic Medicine have passed the most comprehensive examination of knowledge in venous disease available today. Update your online profile, pay your annual Maintenance of Certification (MOC) Program dues, and report your Continuing Medical Education (CME) online. The ABVLM is an independent non-profit organization organized under the laws of the state of Illinois for scientific and educational purposes. No part of its net earnings shall inure to the benefit of any director, officer, or other individual. 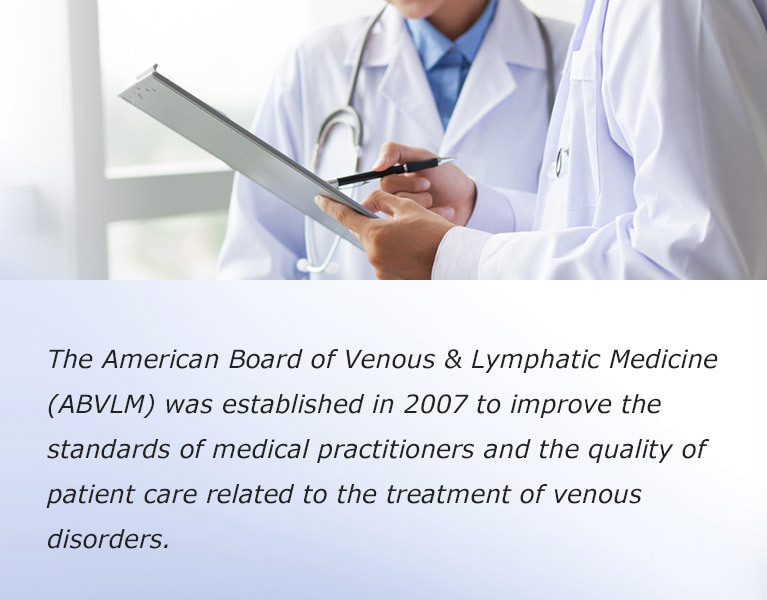 In June 2013 the Board of Directors approved a new name for the organization: The American Board of Venous and Lymphatic Medicine. This change was approved so that our name more clearly conveys the purpose of our organization and the focus of our diplomates. We believe this will help improve communication and reduce confusion when engaging with the lay public, other physicians, health plans, and a variety of governmental and non-governmental agencies. It is not the purpose of the Board to define requirements for membership on hospital staffs, to gain special recognition or privileges for its diplomates in the practice of phlebology or to define the scope of venous and lymphatic medicine practice. The Board does not define who may or may not practice venous and lymphatic medicine. It is neither a source of censure nor an entity for the resolution of ethical or medico-legal issues. The American Board of Venous & Lymphatic Medicine is not yet a Member Board of the American Board of Medical Specialties (ABMS); however, our certification exam is based on standards set by the ABMS. In 2018, our new class of diplomates brought the total number of physicians certified in Venous & Lymphatic Medicine to 820. There are additional physicians who have passed the exam and are considered Board Eligible. Applications to sit for the 2019 exam cycle will open in October 2018, and the review process will commence October 1. The application period will remain open through mid-January 2019. The exam is offered annually in early April, and in 2019 it will be offered March 30-April 13, 2019.